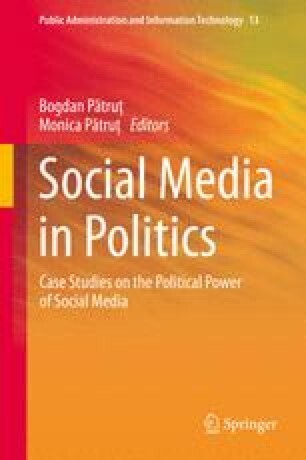 This case study analyzes the use of social media in the campaign for the historically first direct presidential elections in the Czech Republic in January 2013. Following a brief outline of the political context and outcomes of the elections, this study explores and compares the strategies of campaign communication of the nine presidential candidates on the social networking sites Facebook and Twitter. Apart from mapping the dynamics of the campaign and the responsiveness of Facebook and Twitter users, we have used content analysis to examine basic formal characteristics of over 1,000 messages posted on Facebook in the course of the campaign by the candidates and their teams. Additionally, this chapter also examines more closely the place of social media in the campaign of Karel Schwarzenberg, the eventual runner-up of the presidential race, whose team distanced all other candidates in both the extent as the level of sophistication of communication carried via the social networking sites. Overall, the presidential elections have revealed both the potential as well as limits of electoral mobilization through social networks, while at the same time it has demonstrated the continuing importance of more traditional means of campaign communication in the Czech Republic. Research for this chapter was conducted as part of the project VITOVIN (CZ.1.07/2.3.00/20.0184), which is financed by the European Social Fund and the Ministry of Education of the Czech Republic. Effing, R., Hillegersberg, J. van, & Huibers, T. (2011). Social media and political participation: Are Facebook, Twitter and YouTube democratizing our political systems? In E. Tambouris, A. Macintosh, & H. de Bruijn (Eds. ), Electronic Participation (pp. 25–35). Heidelberg: Springer. Retrieved from http://link.springer.com/chapter/10.1007/978-3-642-23333-3_3.